Protesters begin to move from Quarry Plaza to McHenry Library. Photo by Camille Carrillo. “Saint Precaria’s Pilgrimage: National Adjunct Day of Action” aimed to raise awareness about rising administrative budgets and tuition and the precarious working conditions at the UCs. The event is the beginning of the University Council-American Federation of Teachers (UC-AFT) contract campaign. UC-AFT is the union of over 3,000 non-senate faculty and librarians of the UC. According to UC-AFT, in any given term, about 3,000 lecturers teach throughout the UC. On June 1, the lecturer contract terminates and negotiations will begin with the university. 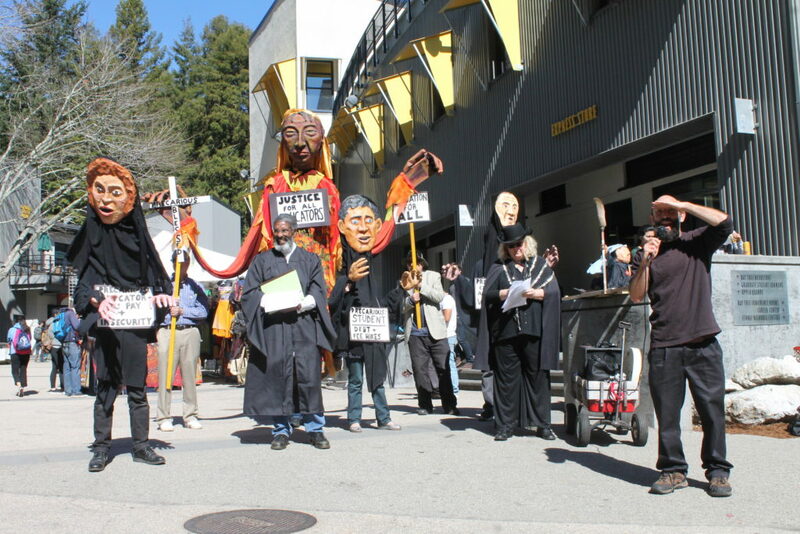 Better pay and shorter probation periods are just some of the benefits UCSC lecturer Chris Gray hopes to see for non-senate faculty. Though the march concluded at Science Hill after stops at Quarry Plaza, McHenry Library and Kerr Hall, Power, a UCSC lecturer, said the pilgrimage is far from over.